After a steering column has been removed, reconditioned or disturbed due to service performed on the steering column or adjacent vehicle components, certain precautions must be observed when installing the column or servicing the steering shaft coupling. The grease recommended for use during assembly procedure is automotive multi-purpose grease or multi-mileage lubricant..
1. Fill coupling body to 1/2″ from top. 2. Place seal cover and seal on steering shaft. 3. 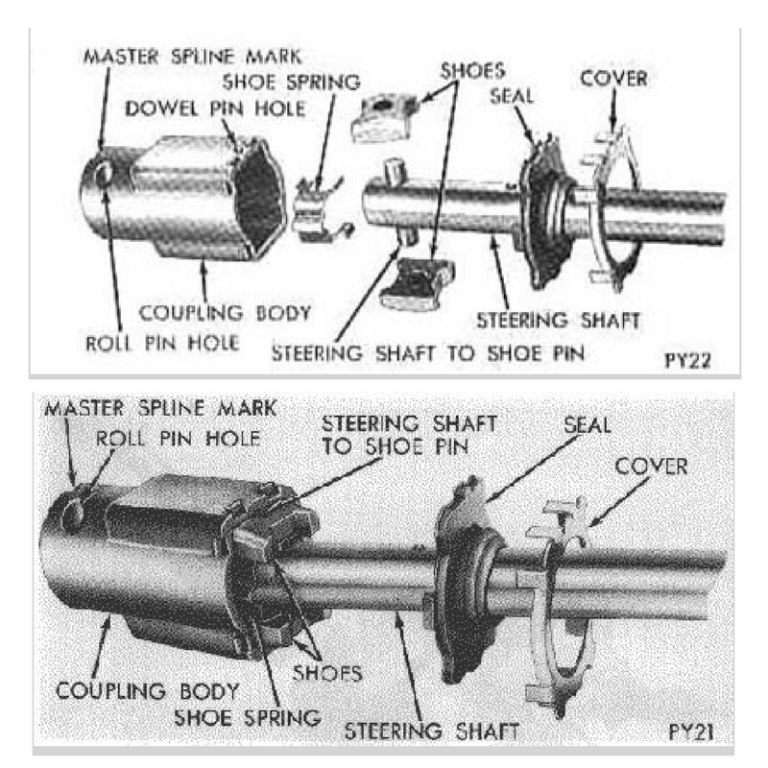 Press the shoe pin into the steering shaft so that it projects an equal distance on each side of the steering shaft. 4. Place spring on side of shaft, straddling the shoe pin. 5. Place shoes on pin ends, flat side of shoes to be toward spring engaging tangs on spring. 6. Squeeze shoes together, compressing spring and push assembly into coupling body. 7. If body has dowel pin hole near cover, drive in a new pin flush to the outer surface. 8. Position seal and cover on the body and crimp cover tangs over projections on body securely.